The dream is that the rest of India could adhere to the same standards that govern the upkeep of the Taj Mahal. The grounds are well-manicured, with nary a speck of trash, paan (the betel-nut narcotic) is prohibited so as to keep users from spitting its bright red juice all over the monument, and vendors are kept to a minimum, thereby providing a mostly tranquil environment in which to view the ultimate of the Seven Wonders. Surrounding the Taj is Agra, one of the more unfortunate cities I’ve seen so far. Although its population is around 4 million, people still refer to Agra as a village; and, indeed, there is a definite village mentality here. Stray dogs, cows, goats, pigs, and chickens wander the streets; men urinate in the gutters in plain view; and one of the main modes of transport is the rickety bicycle rickshaw. The latter probably evokes a sort of turn-of-the-century Asian romanticism, but it seems to me to be a difficult and exhausting form of labor, especially given that it’s the 21st century. Were it not for the Taj Mahal – and the surprisingly magnificent Agra Fort – Agra would have no reason to exist. I hate to make such a negative proclamation, but the city really doesn’t seem to be benefitting from the likely millions of dollars that are dropped into the monuments’ coffers each year. 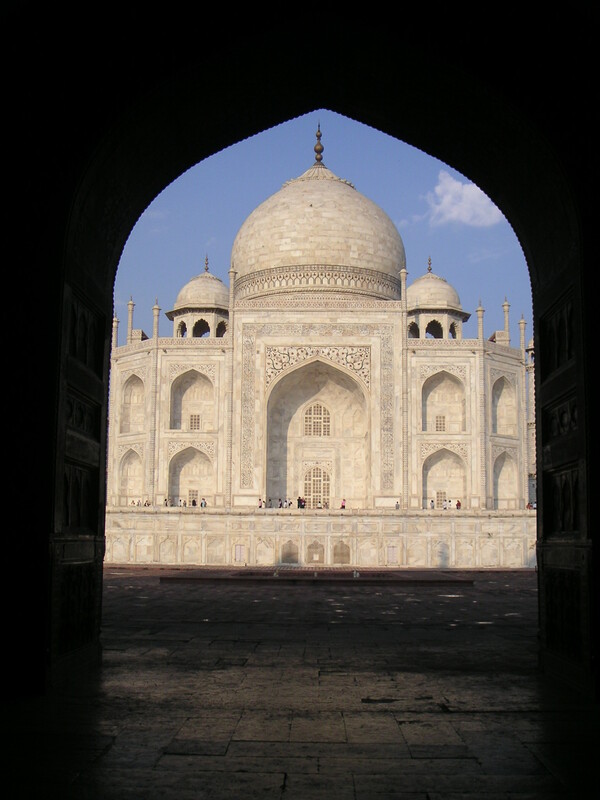 On the one hand, the tourist draw of the Taj Mahal – and the subsequent desire to maintain the Taj in pristine condition – has spurred the government to enact environmental regulations in and around Agra, including the prohibition of industries within approximately a 10,000 km radius and the banning of cars within 4 km of the Taj grounds. However, mass tourism has also brought with it thousands of beggars, hawkers, and impromptu, undocumented city “guides.” Those in this camp are quite certain that the tourists that visit Agra haven’t had a chance to adjust to the exchange rate of the rupee or the going price of things on the local economy. Agra comes with a service charge. Nevertheless, seeing the Taj far surpassed my expectations. I met up with my sister, who had been traveling in Rajasthan, in Delhi, and did a quick, two-day tour of the capital city and Agra. The plan was to see Delhi on Thursday and Saturday and take a day-trip to Agra on the Friday. Unfortunately, I failed to consider – and my less-than-competent travel agent failed to inform me – that the Taj is a Muslim monument, and thus is closed on Fridays. Again, it’s one of the Seven Wonders of the World: you’d think it would always be open. The Smithsonian is only closed one day a year – Christmas – and doesn’t even charge admission. But all was not lost. 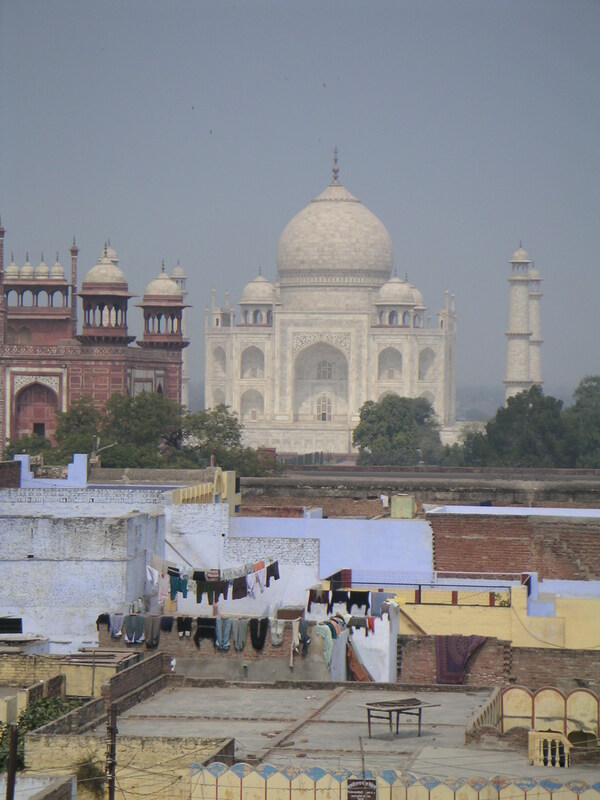 We went down to Agra on Friday morning and had lunch among the Lonely Planet backpack cult on the rooftop of a low-budget hotel with a view of the Taj. We were treated to more lovely views of the Taj as we toured the Agra Fort. The story goes that Shah Jahan, the Mughal who spent a large fortune to to honor his deceased wife with the building of the Taj Mahal, fell ill and was imprisoned by his power-hungry son Aurangzeb. Apparently, Jehan was indifferent to the imprisonment as long as he was able to always have a view of his beloved Taj. 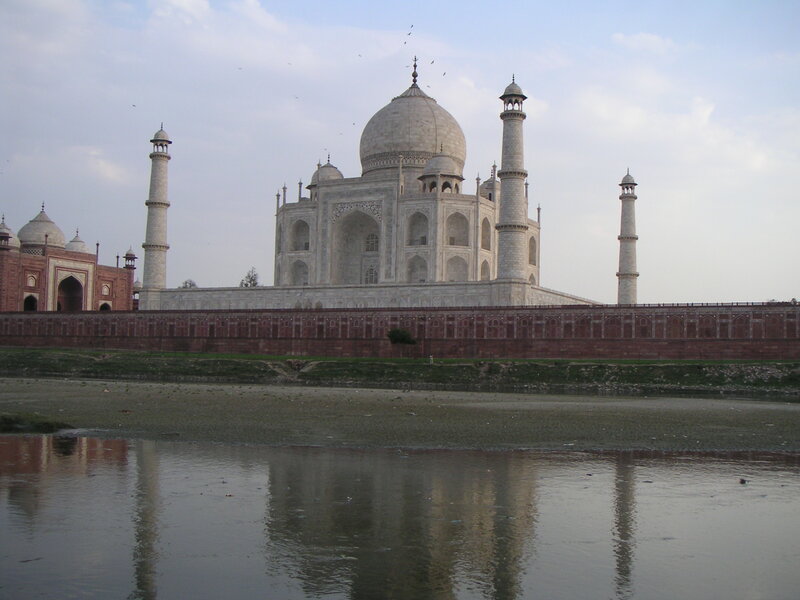 The Taj seemed a bit of mirage when standing on the perch of the Agra Fort, so we opted to get a closer look at it from the banks of the Yamuna River. It’s several months before monsoon season, so the Yamuna was mostly dried up. Greeting us were young kids trying to sell postcards, picture books, and rides on a camel. In addition to us and our swarthy guide/driver, there were a several tourist groups who had also come to Agra on the wrong day and had decided to make the most of it with a visit to the Taj at twilight. I imagine that when the Yamuna is running at full flow, the mausoleum’s reflection must be spectacular. But, I enjoyed the fact that we were able to stand almost in its shadow on the dried-up lake bed. Yet nothing can top seeing the Taj Mahal at sunrise. We rose at 5:30am to the sound of a bit of thunder (no rain at all in Bombay during winter and spring, but there always seems to be the threat of precipitation in north-central India). We arrived by 6:30 (the monument opens at 6am), and found that the rain from the night before had cooled things off and cleared the air. It would have been a nice day anywhere, but within the grounds of the Taj, it was magical. Describing the Taj has been done a million times over, and I don’t think I can say more than a picture can. But, I did have some favorite moments, including seeing the rays of morning sun bursting through the clouds, thereby changing the look of the monument and highlighting its pietre dure stones; having my picture taken on Diana’s Bench (the bench on which Princess Di sat for a honeymoon photo); removing my shoes and walking barefoot on the wet, white marble around the mausoleum; and watching a monkey slide down a lightpost – as if it were a fireman – near the Taj entrance. There were plenty of visitors at sunrise, but I found it surprising that very few ventured to the two buildings that flank the mausoleum. The Taj mosque and the building to the east that was built simply to create architectural symmetry. If the light is right, as it was that morning, the darkness of the east building helped to frame a picture-perfect side-view of one of the most amazing monuments in the world.